“This is how paradise on earth must look like” : Enchanted and awe struck, the great writer Nikos Kazantzakis, once zestfully declared about Naxos. Vast and fertile, and very much garden of Eden- like, the mythological island of Zeus and Dionysus, is not only graced with abundant beauty and a long and intriguing history. It also boasts a distinctly gregarious culture and uniquely affable- and that’s not to mention -characteristically musical people. 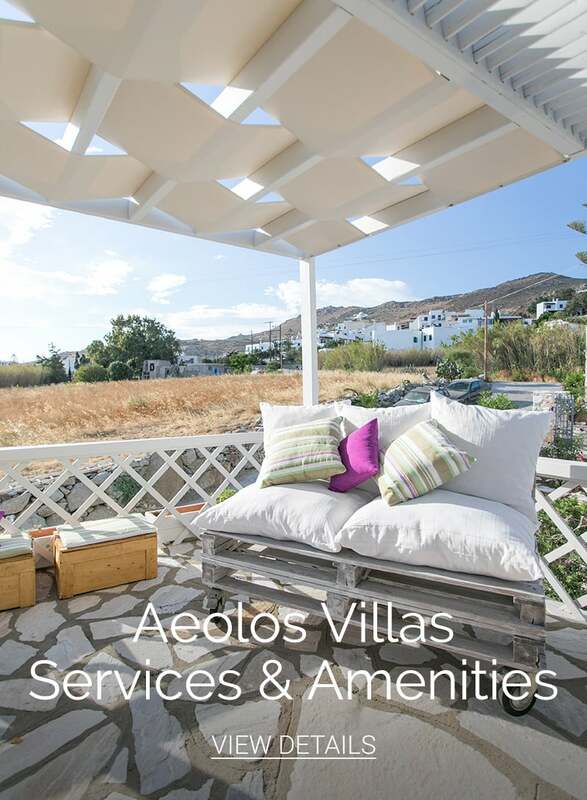 Paying tribute to our island’s time honored legacy and remarkable hospitality ethos, at Aeolos Luxury Villas & Suites in Naxos we first and foremost strive to make you feel right at home, amongst new friends and family. Effortlessly chic and unpretentious, the Aeolos is a complex of two just refurbished, stylish villas and a suite, perched on the hillside of picturesque Agidia. Sitting amidst a verdant, manicured garden with trees and a pond, a covered sitting area, a traditional wood oven, benches and tables, the Aeolos Luxury Villas & Suites in Naxos, blends Cycladic minimalism with modern conveniences and a truly-eco conscious ethos. Responsible practices include the use of photovoltaic panels and solar water heaters, controlled energy and water consumption and recycling; while the Aeolos Estate extends to a a luscious vineyard and vegetable farm, which may be visited by guests. What’s more, in synch with the beauty of its natural surroundings, Aeolos Luxury Villas & Suites offers advantageous, panoramic vistas extending from the island’s mountain peaks and flat countryside, to the main town’s whitewashed sugar cube houses, the sparkling Aegean Sea, and the breathtaking sunset. Family style, family run by the owner, Ms Eleni Savva -a jovial hostess catering to your demands and wishes- Aeolos Luxury Villas in Naxos, await to welcome you and show you what the famous Greek concept of “Philoxenia” (literally being friends to strangers) is really all about. In Greek mythology Aeolos, the son of Hippotes, was the mighty Keeper of the Winds –as mentioned in the Odyssey and the Aeneid. Fascinated by our country’s folks and legends; whilst inspired by the refreshing breeze that gently blows in the area, we have thus named our complex of Luxury Villas & Suites in Naxos. Located in the pristine, agricultural village of Agidia, once the summer refuge of the island’s noblesmen, only 5 minutes from the Chora of Naxos, the Aeolos Luxury Villas & Suites consist of two just refurbished, chic and stylish villas and one charming, fashionable suite with private spacious terraces on to breathtaking views, amidst a luscious, fragrant garden. Enjoy some relaxing moments at the privacy of your villa of choice; but also make sure to spend time in Aeolos well tended garden with the exotic flowers, gurgling fountain and shaded terrace: Proffering a cool oasis under the scorching Greek sun, it is the ideal spot in which to unwind and let go with a good book or a glass of local wine at hand; take the perfect selfie in the specially designated selfie corner; get revived by the breeze; gaze at the sun setting down and lose yourself in the moment.